In Mark Twain’s famous novel - Tom Sawyer lived with his Aunt Polly and his half-brother, Sid. Tom dirties his clothes in a fight and is made to whitewash the fence the next day, as punishment. 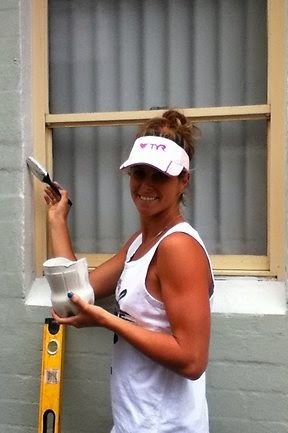 This attractive woman is no Tom Sawyer but has some connection to the whitewash that England suffered in the present Ashes tour. ~ she is an iron-woman…. 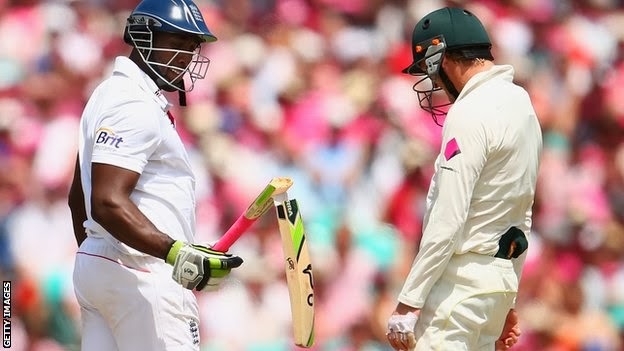 At Sydney, yesterday brought curtains to the England’s worst Ashes series – it was symbolized by the broken bat - Michael Carberry played a regulation defensive shot to a good length ball from Ryan Harris ~ his bat simply snapped in two, the bottom half flapping forlornly against the top. It is not alone the bat, it is the team that were utterly broken. For 10 weeks their batsmen had shown no resistance and now their bats had given up the unequal struggle as well. It was only day 3, England lost the fifth Test by 281 runs on its third day and the series by 5-0. It was the third such margin in history and this one came from nowhere. Only three months ago at home, England had won 3-0; and their coach had stated that the team had practised well ……. .
One of the stars from Australian side is David Warner who bad-mouthed immediately after the 1st test that England were on the back foot and that they had scared eyes……….he also verbally taunted Trott – who eventually walked out of the tour… Swann retired mid-way and England were in tatters by the end. Now by the close of the Ashes, David Warner's superb Test form has ensured his return to Australia's one-day squad, at the expense of Phillip Hughes. Australian selectors have named a full-strength squad for the first three matches. Captain Michael Clarke has returned after missing the October tour of India with a back injury, while James Pattinson will press his claims for South Africa in one-day cricket, rather than for Melbourne Renegades in the Big Bash League, following his call-up. Have not heard much of ‘ironwoman’……… on web search found the meaning to be : a female athlete of remarkable endurance or durability. The Iron Woman is the 1993 sequel to the popular Ted Hughes novel The Iron Man. "The Iron Woman has come to take revenge on mankind for its thoughtless polluting of the seas, lakes and rivers" says the introduction to the novel. 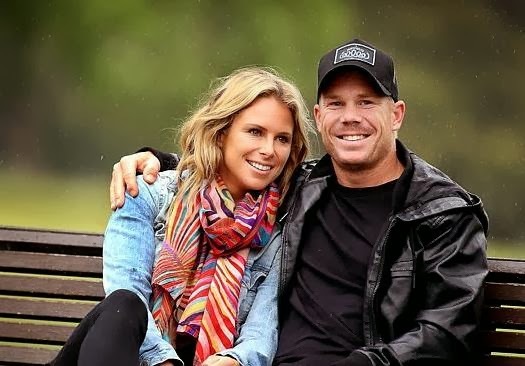 Media reports suggest that Dave Warner's relationship with ironwoman Candice Falzon has been the secret to his return to form, culminating in a sensational start to the Ashes series. That is the opinion of his father, Howard, who watched Warner at the Gabba as he raised his fourth Test century. ''He's got a new love life now and she's been a great asset to him, she really has,'' Warner snr said. ''She's calmed him right down, he's not on beer, which hurts me because he won't buy me one any more. We went out for dinner last night, he'll have a couple of glasses of wine and then he'll go straight onto ginger beer or something. He's back in his bed by 10 o'clock of a night time. He's doing everything right, even when he's not playing cricket he's training every day with Candice. She's done well.'' He said Falzon's professional attitude had made all the difference. Candice Ann Falzon, the woman under reference is an Australian professional (of Maltese heritage) ironwoman, surf life saver and model. Candice Falzon was, at 14, the youngest ever professional in the Ironman series. At 16 she was a NSW state ironwoman champion. The sport of Ironman was developed in 1964 in Australia by Mr Valentine Trainor to combine the four main disciplines of surf lifesaving into a single race; swimming, board paddling, ski paddling and running. An Ironwoman competition is no easy feat. Competitors power through a surf swim, a board paddle, a run along the sand and the surf ski. The determination you need is mind bending for the average beachgoer. In her Ironwoman career, Candice has won over 60 medals in the Sydney branch titles, over 30 at State Titles and 9 Australian medals. She has also completed the Gruelling Coolanagtta Gold event three times fi nishing 8th in 2009. It is not simply about the beautiful beaches of Australia – more of hard training, professionalism and strong (iron) mind….. Still ~ whether these could have in any manner contributed to English white-wash in the present Ashes series is left to you for deciding ! !